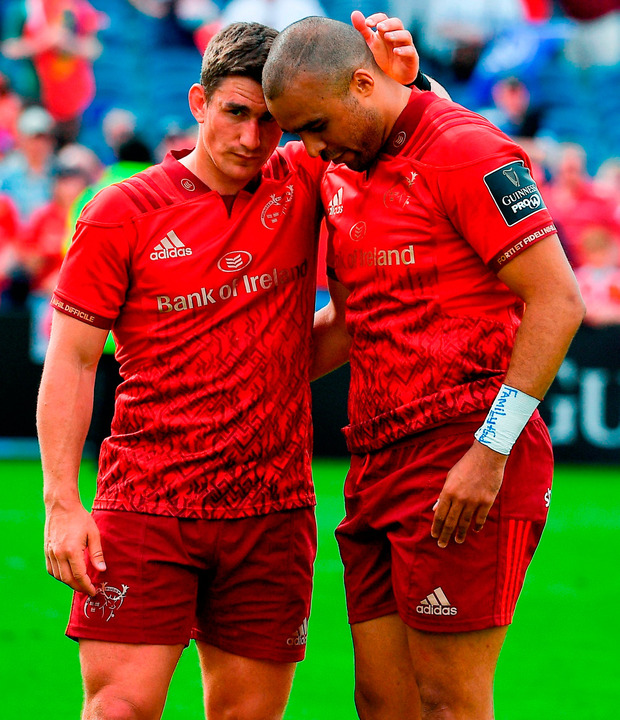 One miserable point is all that was between Munster and finally a final. That's seven semis in a row lost and gone. Did Leinster deserve to win? Just about. The men in blue showed some skill and great courage in defence on a day when the longest queue was for the ice cream van. Leinster just about kept their cool in the final play of that last hundred seconds when Munster fought their way down the field. Munster, as ever, were inspired by that eternal red flame that always blazes when the dying embers are all but dead. We were proud then and we will be proud again. That last 100 seconds was a homage to the old and present Munster values of giving your all for a cause worth fighting for. Leinster will be proud too of their kids on day when Isa Nacewa went off and Jonathan Sexton didn't come on. Rob Kearney, the third of the ruling triumvirate, was also out injured. Young Rory O'Loughlin's tackle near the end saved the day. He lives just across the street from the field and he has been coming here to cheer ever since he was a small boy. vulnerable Munster will see this as the one that got away for if there was ever a match when Leinster were to be beaten, then this was it. Every great team has a vulnerable day. Think Dublin-Donegal in 2014. Saturday was that day. The last winning penalty was very harsh on Munster who struggled to get penalties when their scrum was on top. For a penalty of that magnitude to be given, the referee has to be more than sure. It was a 50-50 call or possibly a Munster penalty as it seemed Andrew Porter may have wrestled James Kilcoyne to the ground. That said, the 22-year-old Porter made a massive difference when he came on. His back was so straight and so solid you could have driven a lorry over it if Ballsbridge bridge fell in the flood. The good news is we will have him for Ireland. Leinster were that bit more skilful and assured in attack. Their passing was better. Munster tried too many speculative passes. The Munster pack, bar for a few scrums when Porter came on, were well on top. Peter O'Mahony's jersey was drenched and he was the man amongst men. James Ryan was good but at one stage when he was left in open field, he only galloped on at half trot. Ryan was fearful no doubt that he might injure himself if the gallop went at full speed. By the end Ryan looked drained. If Ryan is not minded, he will not last. The RDS isn't quite Thomond Park. The tension was there though in abundance. I made my way to the pitch side. Right at the end. Munster worked their way down the field in a desperate attempt to find just one score for glory. Several Munster fans were close to jumping the bonsai privet hedge separating the supporters from the players. Not a person sat. The whole place was screaming. The players were worn. It was a hundred seconds we will never forget. Yes the RDS is a place where you can hear the players' hooves. Thomond is a palace but the RDS needs a refurbishment which must include knocking the whole place to the ground. I never saw so many portapoos. What a terrible inconvenience it is for men and women with nine or 10 bathrooms at home to have to do their business on pungent, sans bidet, chemical toilets. Fully 15 minutes into the game there were still throngs arriving unfashionably late. "Maybe they were held up by the Royal wedding," the Limerick man in the train home suggested. There weren't many stereotypes around in the RDS. The Leinster fans from within and without Dublin were respectful, and gracious in victory. There was no rubbing it in. Both sets knew there was a glory here for both teams that should not be diminished by tribal rivalries. And let it be said, for the record, most of the Munster fans supported Leinster in Bilbao. Leinster are a team badly in need of a song. All they have is a one-line Dublin GAA ditty of "come on you boys in blue." There was a Wexford lad behind me in the Main Stand and the only time he shut up all day was when "Come on ye boys in blue" was belted out. But I have a song for Leinster and it's a platinum golden oldie, once sung by a Diamond in the Leinster home ground. The new Leinster anthem must be 'Song Song Blue'. Munster though will always 'Stand up and Fight'. Maybe they tried too hard. But this fault can be fixed and this fault came from caring too much. scars I sincerely hope the harsher fans will not go after players and management like they did when Antony Foley's team was finding its way. Ripping up good men only serves to erode confidence. The scars never really heal and there is a breakdown in the relationship between the team and the supporters. The Munster fans who travelled to the RDS and Bordeaux were exemplary. Their unconditional love, the prerequisite for greatness in teams, was there for all to see. The whiners waited at home, whinging. Munster were only beaten by one point by the champions of Europe, after a harsh penalty, away from home. Munster lost by five points in France to Racing after a terrible start. I wouldn't be writing off Munster any time soon. This year was a big step up from last year. Munster are very near to glory. As for Leinster, go on and win it now.